Yesterday was such a busy yet fun day! In the morning I played tennis- trust me I'm not that good. Then off to the city for a nice afternoon/evening. I went to the Stripes & Sequins x Bauble Bar party in Soho for some shopping and crafts! It was so nice meeting Grace and diy-ing! Bauble Bar's pop-up shop is so fun- I recommend a visit if you have the chance. Afterward, I went to Momofuku Milk Bar and picked up some yummy cookies. What is your favorite cookie/sweet from Momofuku? I ended the day with shopping at the Kate Spade Saturday Window-Shop! Might be the coolest way to shop! 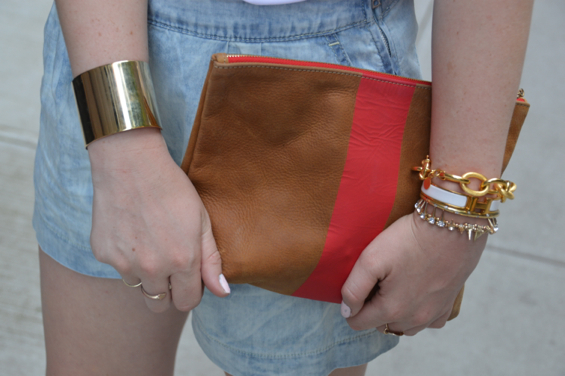 I wore my new favorite shorts from Rebecca Taylor. I love the bleached look they have- the fit is also really nice! I kept the look simple and easy with some of my favorite items-Clare Viver clutch and Vince shoes. Be sure to check back later this week to see the pieces I picked up from Bauble Bar and the fun DIY project I created! the kate spade saturday window shop is such a cool idea! Tennis sounds fun! I haven't played in a few years but I would love to get back into it!